We’ve created organic vitamin supplements that address the specific needs of women: breast and reproductive health, bone density, heart health, digestion, energy, immunity, and stress reduction. It’s simply whole fruits, vegetables, and herbs cultured to their best state so you can be your best self. I have been using Movita vitamins for close to three months now and I finally believe I have come across a multivitamin that works for me. With other multivitamins I either don’t notice a difference in how I feel or I become nauseous. 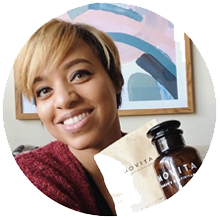 With Movita I don’t feel sick and I always notice a bump in my energy and mental clarity. I’m hooked for life. Thank you Movita! VGN AF is a wellness destination created by Rachel and Robin Thompson. It was born out of the desire to highlight their own personal health journeys. *The information and content on this website is provided only for informational purposes. It is not meant in any way as a substitute for the professional advice provided by your physician or any other healthcare professional. The statements on this site have not been evaluated by the FDA. Our products are not intended to diagnose, treat, cure or prevent any disease. If you are pregnant consult your physician before beginning any new health protocol. Designed specifically to support healthy hair, skin and nails, Movita Beauty was formulated with thought of your needs. Beauty from the inside, out!